In this ongoing phase III prophylactic vaccination trial of HPV16 L1 VLPs, women without evidence of HPV16 infection were vaccinated three times with HPV16 L1 VLPs or placebo and followed for new persistent HPV16 infection or development of CIN (11,67). aDuring the first 1.5 years after immunization, vaccination provided 100% (95% confidence interval: 90-100; p < 0.0001) protection against acquisition of persistent HPV16 infection. Although, 41 incident persistent HPV16 infections and 9 HPV16 DNA positive CIN (high- and low-grade) occurred in the placebo recipients, 22 cases of non-HPV16 CIN occurred in both placebo and vaccine recipients. b After 3.5 years, vaccine efficacy remained high. Although, 87 incident persistent HPV16 infections and 24 HPV16 DNA positive CIN (high- and low-grade) occurred in the placebo recipients, 42 cases of non-HPV16 CIN occurred in vaccine recipients (vs 27 cases in placebo recipients). Fig. 5. Addition of L1 VLP from HPV genotypes in addition to HPV16 will have limited benefit. 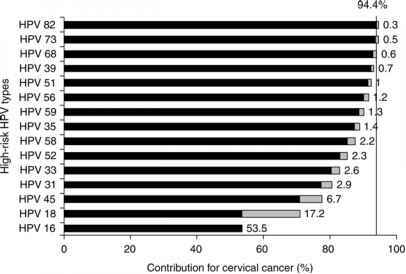 Percent of cervical cancer cases attributed to the most frequent HPV genotypes in all world regions combined (women 15 years of age and older) are given in black bars. Cumulative frequencies in order from the most prevalent types is shown in gray. A completely effective and type specific HPV prophylactic vaccine would require 11 distinct formulations to prevent ~95% of cervical cancer (72). immunogenicity of L2 can be overcome with suitable adjuvants, protection induced by vaccination with L2 could potentially be very broad. The extent of cross-neutralization by an L2 vaccine might be enhanced by the generation of a synthetic consensus L2 antigen. The breadth of the cross-neutralizing activity of L2 antisera suggests the possibility that this vaccine antigen might also prevent transmission of HPV types that cause benign genital warts, and possibly even plantar/planar or Epidermodyslpasia verruci-formis type warts. In contrast, the L1 VLP vaccine, especially in a highly multivalent form, is likely to be expensive to produce, as the L1 is expressed in Sf9 insect cells (by GSK) or yeast (by Merck). An added benefit to the L2-based vaccine is that production of a single L2-based antigen produced in Escherichia coli is likely to be less expensive to produce. It should be noted that L1 capsomers can be produced in E. coli (78). The L1 capsomer vaccine exhibits good stability and induces protection in the canine model (79), albeit likely type specific as for the L1 VLP vaccines. Another possible approach is the use of L1-expressing DNA vaccines that might be more stable, easier to produce and multiplex at low cost. The issue of cost per dose is especially important as more than 83% of cervical cancer deaths today occur in the developing world (16) that lack the infrastructure for Pap screening and lesion ablation. Furthermore, all of these vaccines require a cold chain, which is likely to be problematic in rural, hard to access areas. 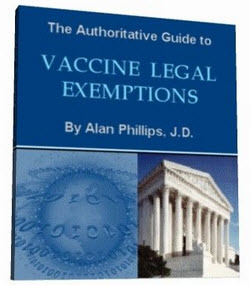 They also require multiple immunizations with needles. 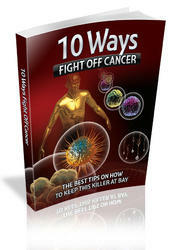 Perhaps the use of a live vector to deliver the HPV capsid antigens, for example, nonpathogenic Salmonella or VSV, could overcome many of these issues, although safety would be a significant concern. Future efforts in second generation HPV vaccines should address these issues.